We're home from our two week vacation ... and it's SO nice to be home. Today will be a day of getting things organized, clothes washed, groceries bought and getting back to normal life. While on vacation, I totally had the idea that I would blog everyday ... but I just didn't have the time. I do plan to share photos of our vacation with you very soon and some of the fun things we did. The reason you see my banner above is there are big changes coming to Missy Made It!. I've been notified by the folks that I use to build and maintain my website that they are no longer going to provide this service come January. I've been using Freemerchant's service for 10 years now and I just love them. It was so easy to use their site to build and maintain my website. After much consideration I've decided I will offer my items only in my Ebay Store. And you know what? I am very, very happy about this. It's so much easier to offer pre-made Paper Piecings, Punch Art and Tear Bears for me. With my two-year old monopolizing the majority of my time it's very hard to find the time to get custom orders completed. And that is so not fair to my customers. So ... with the Ebay store ... it will be much easier to maintain. Who knows ... I might even offer some stuff that's not scrapbook related on there too. I'm trying to figure out where to have my missymadeit.com URL pointed. I'm thinking of having it pointed here to my blog and then you will find my Ebay Store Link and such. What do you think? We arrived in Florida yesterday. It's so good to be home. My mother-in-law's Thanksgiving get-together is today and I am really looking forward to seeing everyone. We have a few traditions that we always do the Saturday before our Sunday Thanksgiving. One is to have Peebles BBQ for dinner ... yum! The other is the "peeling the boiled eggs" tradition. Basically my MIL boils about 3 dozen eggs for deviled eggs, the dressing and such. Before dinner we sit there and peel them all together. It was nice because Mike's step-sister Valerie and her girls Samantha and Lauren were here this year. It may seem like a silly tradition, but one I've always looked forward to. Griffin is sick ... he's coughing and has a runny nose. He did not get sick until yesterday morning. We left on Friday afternoon and stayed overnight in Savannah. I think he picked the bug up in our hotel room. Hopefully he will be feeling better soon. Well it's off to help my MIL with whatever she needs help with. Bye, Bye! This picture has nothing to do with today's post ... but I'm trying to include a picture with each post and I thought this was cute. So ... we are headed home for Thanksgiving. I am so excited about this. We will see family and friends that we miss so much. I have lots of orders packed and ready to ship before we leave. I'm excited about that too. And ... I am taking lots of scrapbooking stuff with me so I can scrapbook while we are there. And June ... if you are reading this ... I will be bringing your gift with me ... I hope to be able to give it to you in person. I've sent you a couple of emails ... have you gotten them? I went back to the doctor about my foot yesterday. I fully expected him to say I was all healed up. But then deep down I knew he wouldn't. I still can't get my shoe on my foot. He said I would have to wear the boot at least another 3 weeks and it would probably be another 4-6 weeks before I could wear my regular shoes. He checked my knee because it's still bothering me alot and he said it's probably deep bruising and needs time to heal. He said if it's still bothering me after the first of the year I should come back. I fully expected to go in yesterday and he say, yes ... you're all healed ... but I guess I really knew that wouldn't happen because my foot is still tender. Oh well ... I guess I'll just have to wear this very glamourous (not!) boot another while longer. 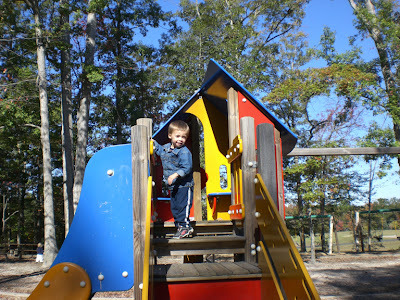 The other day we went to Crump Park in Glen Allan with Heidi, Ryan and Evan. On the one side of the park they have this fabulous playground with swings, all sorts of climbing toys and such. 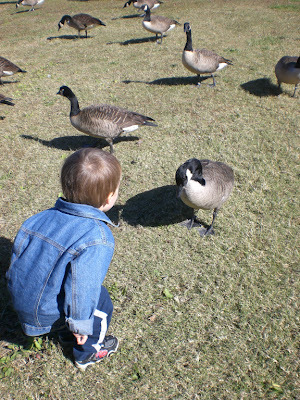 On the other side of the park there is a lake with tons of canadian geese and ducks. 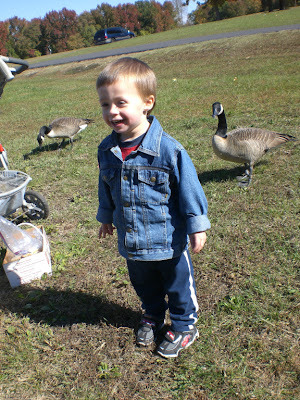 We fed the canadian geese and ducks lots and lots of bread that day. 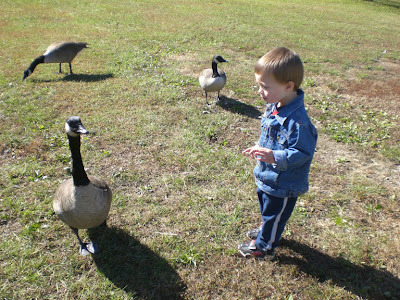 Griffin was a little timid at first because the geese came right up to him. But he quickly got down to their level to give them a little talking to. 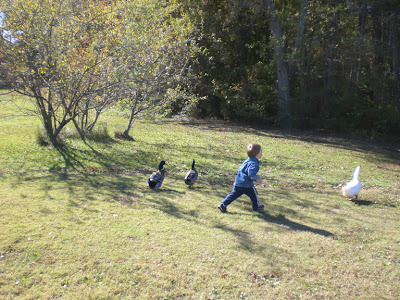 And finally ... ducks & geese beware ... Griffin is on the loose. I love being a Mommy ... I am reminded each and every day how very blessed I am to be the mother of this very sweet child. Never has it been more apparent to me than yesterday. We had no big plans ... just Griffin and me home all by ourselves all day long. And I loved it. The entire day centered around Griffin and what we could do together. Of course it's that way most days, but for some reason yesterday was just special. Often times we have plans to go to the park, the museum, the zoo ... but yesterday ... we stayed home. Sometimes I wonder am I spoiling him by taking him to these places so often. When I was a child going to the park or the zoo was a special occasion. But with Griffin and I it's the norm. Then I think ... my parents didn't take me all the time because they probably couldn't. The good thing is ... I can ... and do. 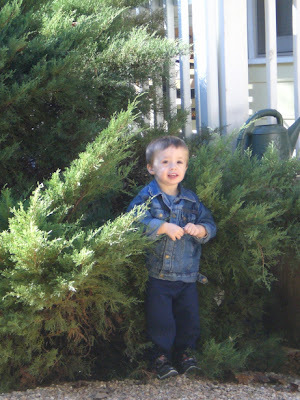 I love exploring new places with Griffin and I love to see him learn new things. I am so blessed to be the mother of this sweet child. I just love the colors, the smells, the weather, the foods, the holidays of fall! 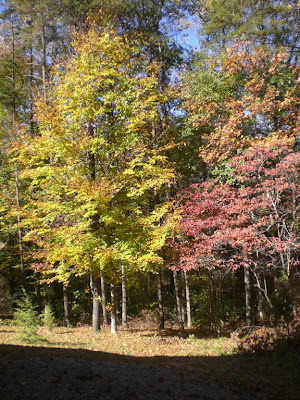 Although the leaves are currently changing here, they are not as vibrant as they have been in years past. From my understanding, it's due to the lack of rain we've had this year. 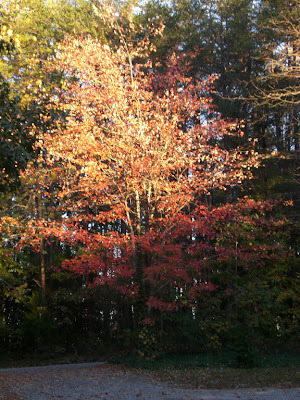 I thought I would share pictures of some of the trees in our yard. 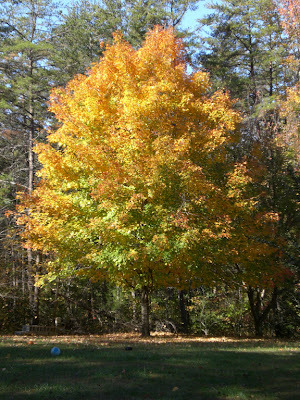 This is my FAVORITE tree ... it's a maple ... not sure what kind of maple it is though. Right now as I'm looking outside, it's almost an irradescent orange color ... just beautiful!! These two trees are in our back side yard. The are currently a gorgeous yellow and red colors. And this tree is in our front yard ... it is sooo vibrant red ... these pictures just do not capture the magnificant colors. 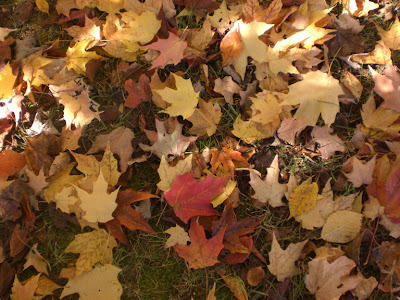 And how about a sprinkling of fall leaves on the ground? I think it's so beautiful to watch leaves twirling and dancing their way from the branches to the ground. Fall ... I just love it! 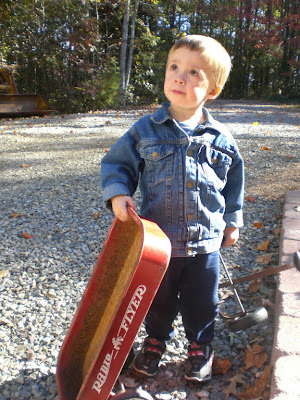 The other day when Griffin and I went out to play, he discovered his red wagon was broken. 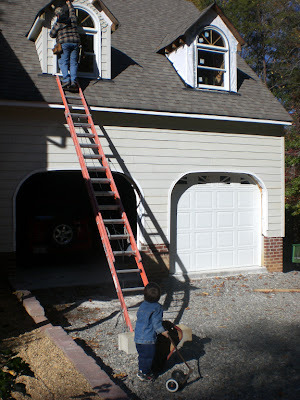 I said "Oh No ... we better go see Daddy to see if he can fix it". He grabbed both parts and headed around to the front of the house where Mike was working. He was so cute!! 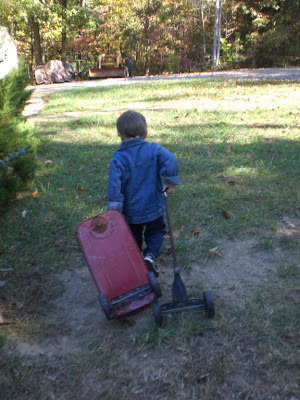 I thought I would share a cute little story in pictures with you about G's broken wagon. 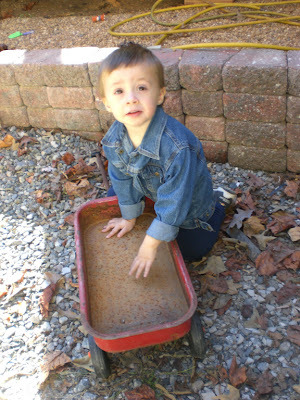 What's a boy to do when he has a broken wagon? 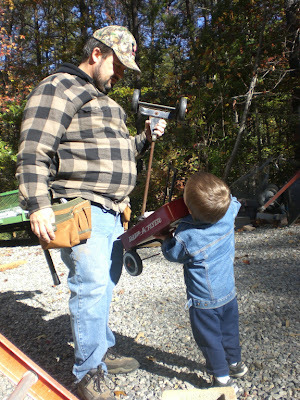 He fixed it ... Daddy fixed it! Although you can not tell in this picture at the very moment I snapped this pictured Griffin said "He fixed it". 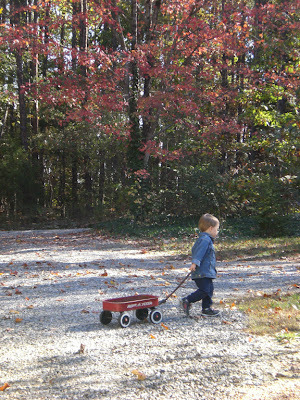 And off he goes with a repaired wagon ... searching, exploring, doing things only a sweet two-year-old boy can do with an adventurous nature and a red wagon. Has it really been 10 days since I last blogged? It can't be possible. I did go to the doctor and I did break a bone in my foot. They gave me this funky boot like thing to wear and it certainly makes walking alot easier. I sure wish they had given me this boot to wear sooner. 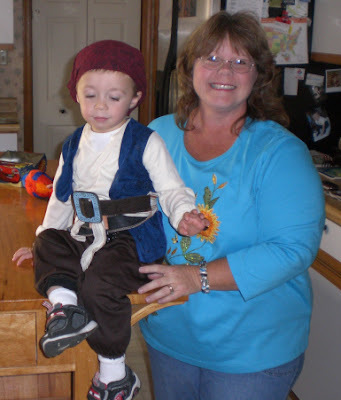 We had a really nice Halloween ... Griffin dressed up like a pirate this year. He was so cute. I barely get any pictures of his face these days, so this is one of the best pictures I got of him this year ... and his eyes were closed. 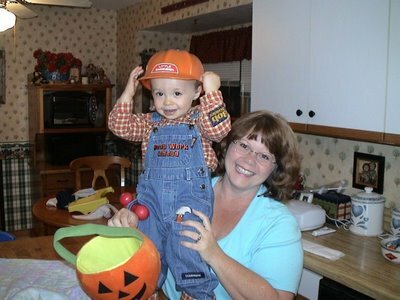 I thought I would share with you the past 3 Halloween pictures ... my how he has grown! !